Melissa Morelli Lacroix explores the love and longing, loss and pain, grief and healing found in the music of Frédéric Chopin, Clara Schumann, and Claude Debussy in a series of poetic cycles that respond to each composer’s work. Lacroix writes with her ear finely tuned to the music of death and decay, to the harmonies and discords of music, nature, and human desire. Always, in A Beautiful Deception, we find the chords of love and devotion being torn apart by the deterioration of the body. Lacroix uses her research into the composers’ lives to add layers and nuance, thus creating a complex triangle between the reader, the music, and the poet. Woven almost imperceptibly into these accounts of three composers and their respective fights against the decay of the body and the mind, lies the thread of the poet’s own relationships and loss. 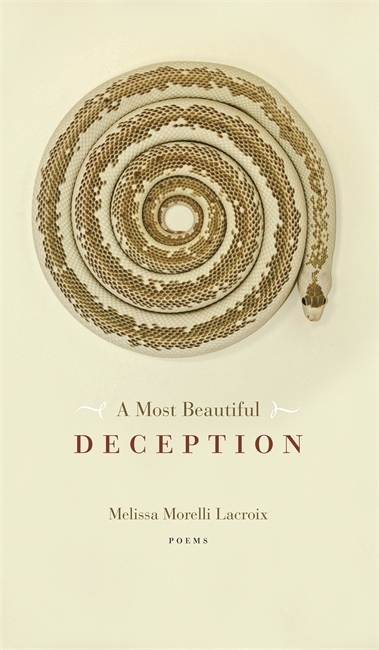 Melissa Morelli Lacroix is a writer, teacher, and editor who lives and works in Edmonton. She has degrees in creative writing from Lancaster University and the University of Alberta as well as a certificate in Translation Studies. Melissa teaches piano and writing.